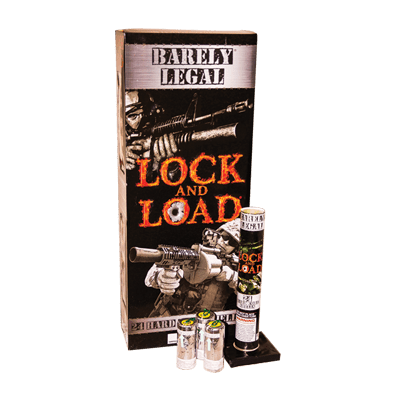 Lock & Load Artillery Shells – THEY’RE BACK! You have to see the size of these bursts to believe them! An ultimate combination of 24 totally different canisters and effects make this a must-have kit! #100 Purple Tube - Single-shot mortar tube. Image on packaging reflects the effect seen. Artillery Shells - Six different artillery shells, with various effects! Looks Dangerous Artillery Shells - 12 shots of loud 1-3/4_ shells with multi-color chrysanthemums and crackles with silver tail. #300 Max Green Tube - Single-shot mortar tube. Image on packaging reflects the effect seen. #300 Max Grey Tube - Single-shot mortar tube. Image on packaging reflects the effect seen. 1" Mini Artillery Shells 12 Pack - 1" mini-mortar kit. Shots fire up to 60-70 feet in the air and burst with color. Festival Balls - 6 Mortar set with varied effects. AR15 - 30 Shot mortar. One of the newest mortar kits on the market with 30 different shells.